During a drill, SWAT team members prepare to secure a ship in Bainbridge Island, Wash.
U.S. law enforcement at all levels has undergone a dangerous militarization in recent years, with heavily armed SWAT teams being deployed to serve warrants and for drug searches, but rarely for the hostage situations they were designed for, the American Civil Liberties Union says in a new report. -- "In 2010, 7-year-old Aiyana Stanley-Jones was killed when, just after midnight, a SWAT team threw a flashbang grenade through the window into the living room where she was asleep. The flashbang burned her blanket and a member of the SWAT team burst into the house, firing a single shot, which killed her." -- Jose Guerena, a 26-year-old Iraq War veteran, whose wife heard a noise that turned out to be a SWAT team. Guerena "picked up his rifle, with the safety on, and went to investigate. A SWAT team fired 71 shots at Guerena, 22 of which entered his body and killed him." -- 62 percent of SWAT raids were for the purpose of conducting drug searches. 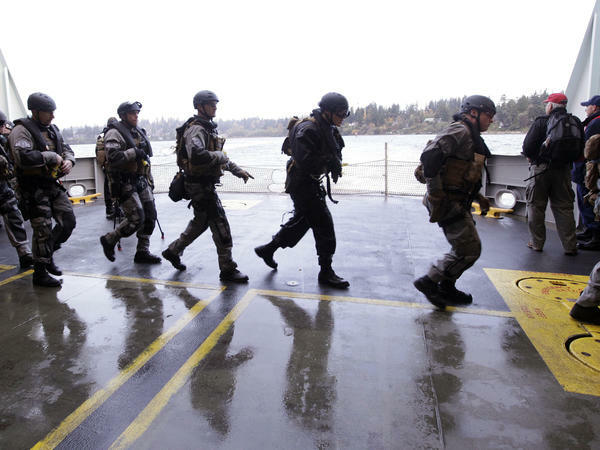 -- Just 7 percent of SWAT raids were "for hostages, barricade, or active shooter scenarios." -- SWAT raids are directed disproportionately against people of color — 30 percent of the time the "race of individual people impacted" was black, 11 percent of the time Latino, 20 percent white and 30 percent unknown. -- Armored personnel vehicles that local law enforcement agencies have received through grants from the Department of Homeland Security are most commonly used for drug raids and not school shootings and terrorist situations. -- In cases in which police cited the possible presence of a weapon in the home as a reason for utilizing a SWAT team, weapons were found only 35 percent of the time. 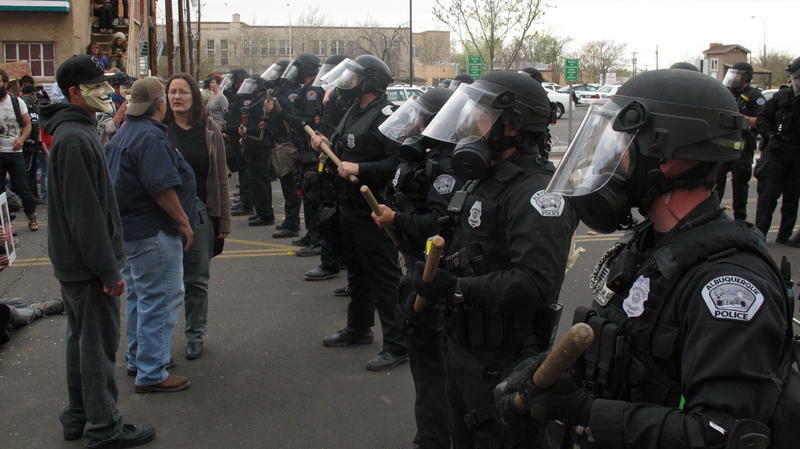 An hours-long protest against recent police shootings spun out of control late Sunday in Albuquerque, N.M., as officers in riot gear reportedly used tear gas and other methods to break up crowds. Hundreds of people took part in the rally, which spread over several streets. Protesters eventually clashed with police, who threw gas canisters and charged at members of the crowd to break up the gathering, according to The Associated Press, which quotes the city's Mayor Richard Berry calling the situation Sunday night "mayhem." 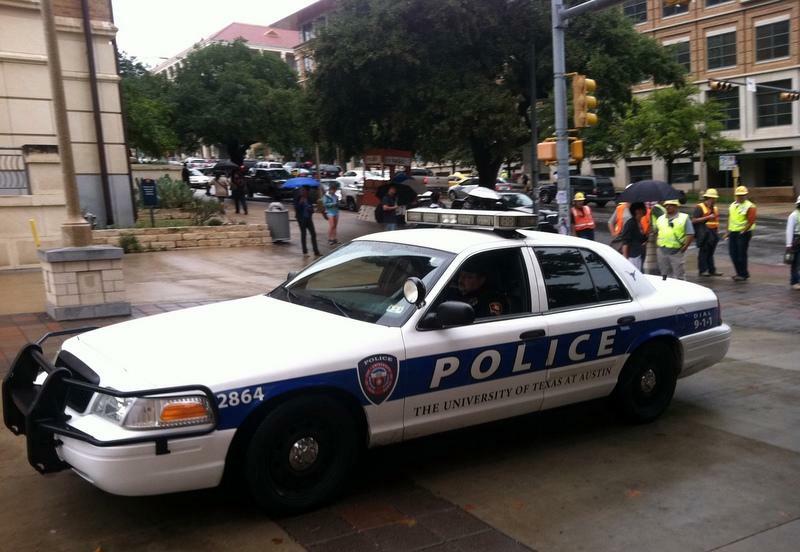 The University of Texas Police Department sees a drop in crime rates over the summer as many students leave Austin. Now that students are back on campus, UTPD advises students to be aware of their surroundings, have a game plan when going out at night and to report all suspicious activity. That's according to UTPD Officer Layne Brewster, who regularly sends Campus Watch emails to the UT community recapping reports of crime at the university.